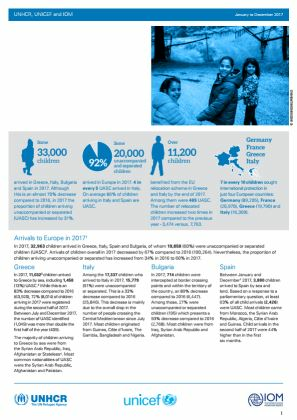 Between January and December 2017, approximately 33,000 children arrived in Greece, Italy, Spain and Bulgaria. This represents a decrease of 70% compared to 2016. However, the proportion of unaccompanied or separated children (UASC) jumped by 31%, to 20,000 (representing 92% of children). 92% of children who arrived to Italy through the Central Mediterranean Route were UASC. Over 11,200 children, including 465 UASC, benefited from the EU relocation scheme in Greece and Italy in 2017. 70% of children arriving in these countries sought international protection, with Germany receiving the highest number of asylum applications (89,205).